1 of 4 Coat pork chops in Wondra flour. Reserve unused flour. Heat oil in a large nonstick skillet over medium-high heat. Add pork and cook 2 minutes per side. Remove to a plate. 2 of 4 Add onion to skillet and cook 1 minute, stirring so onion doesn't burn. Add red pepper and garlic and cook 1 minute. Stir 1 tablespoon of the reserved flour into broth and add to skillet; stir in mushrooms, vinegar, parsley, basil, black pepper and salt. Bring to simmer. 3 of 4 Add pork; cover and simmer on medium-low heat for 10 minutes, turning after 5 minutes. 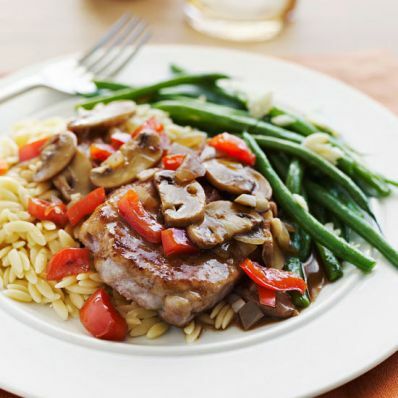 4 of 4 Serve pork with the cooked orzo and Garlic String Beans (recipe follows). Serve extra sauce on the side. 1 of 1 Bring a large pot of lightly salted water to a boil. Add 1 pound green beans, trimmed, and cook 5 minutes. Drain. In same pot heat 1 tablespoon olive oil; add 4 cloves smashed garlic and cook until golden. Add string beans and 1/8 teaspoon salt. Stir to heat through and coat with oil.